Over 400 astronomers have called on the European Space Agency (Esa) not to cancel a space mission designed to look for Earth-like planets in space. The Eddington planet search mission, as well as the lander part of a mission to Mercury, could be dropped to save cash. "The case for Eddington is strong," says supporter Professor Ian Roxburgh, of Queen Mary College, London. But a top Esa official told the BBC the situation for the mission was severe, and that it was likely to be cancelled. If built, Eddington would be launched in 2008. As well as searching for planets around other stars, it would detect stellar vibrations that will enable astronomers to map the interior structure of stars. This would help scientists understand better the evolution and ages of stars. All agree it would be a worthwhile mission that would push back the boundaries. But Esa faces a major problem in funding for its space science missions. All of them, with the exception of Eddington and a mission called GAiA designed to map our galaxy, are heavily over budget. To remedy the situation, the Esa Executive is proposing to cancel Eddington. It also wants to terminate the lander segment of the BepiColombo mission to Mercury. It would be the first time that Esa has cancelled a space mission. The agency's own space science committee wants to cut back costs on all missions and relegate Eddington to reserve status. Some astronomers say that would effectively kill the mission. A letter calling for its retention has been delivered to Esa. It has 414 signatories from astronomers in Austria, Belgium, Czech republic, Denmark, Finland, France, Germany, Greece, Hungary, Italy, Poland, Portugal, Spain, Switzerland and the UK. The petition says: "I am writing on behalf of the European Scientific Community involved in the Eddington Mission to express our alarm over the current threat to Eddington and to press very strongly that a way be found to ensure that it remains within the scientific programme of Esa. "The mission also has very strong appeal to the non-specialist public, particularly through the potential detection of other Earth-like planets which would have a huge impact on our perception of our place in the Universe," Professor Roxburgh told BBC News Online. Professor David Southwood, head of Esa's science programme, is sympathetic to the concerns of Eddington scientists, but feels there is little that can be done given the budget problems which he says are a result of tighter financial control on space projects these days. "Eddington itself is a mission that is very clever and ground-breaking," he told BBC News Online. He added that part of the problem has been brought about by the grounding of the Ariane launcher and its impact on the Rosetta comet mission, which had to change its target. David Southwood said the loss of this one mission would not stop Esa pursuing its grand quests. Eddington was initially selected in 2000 as a reserve mission to be implemented were there to be a delay in the schedules of either the James Webb Space Telescope (Hubble's follow-on) or Lisa (a gravitational wave detector in space). 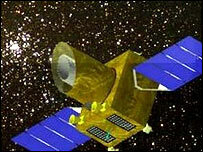 In 2002, it was fully approved as part of Esa's Cosmic Visions programme.